If you cannot make up your mind over sweet or savoury, why not combine both and make this Steamed Honey Cheese Cake / Cupcake? We just came back from our New Zealand trip and bought some local honey and cheese as well as some gluten-free self-raising flour. 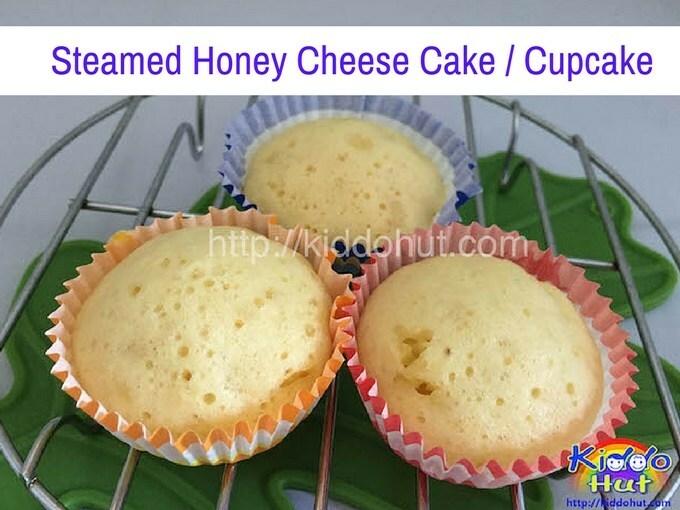 Combining these three ingredients, I came out with this steamed honey cheese Cake / Cupcake (gluten-free) recipe. Although I used Gluten-free flour, you can just replace it with normal plain flour. 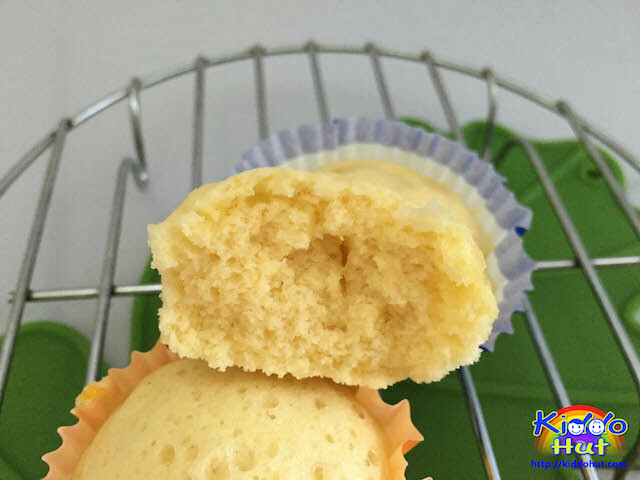 Just like my other steamed cake recipes, I used eggs as the leavening agent in this recipe as I am serving these cakes to my toddlers, I prefer not to use baking powder. I feel that eggs are still better option than baking powder. Hence, the eggs are beaten till light and fluffy to introduce adequate air as leavening. As these cakes are for my toddlers, I have reduced the amount of sugar. If you are a person with sweet tooth, I would suggest that you increase the sugar from 40g to 50g or 60g. I have also tried replacing the grated cheese with cream cheese, but the cheese aroma is not as strong compared to using the grated cheese. So, if you do not like cheese but still want calcium in your cake, use the cream cheese. This cake is moist, soft and fluffy. Give it a try and make a quick breakfast or tea for your family when you are in the mood for sweet and savoury at the same time! 1. Do not leave the batter out for too long, i.e. once the batter is done, it is best to be spooned into the muffin cups immediately and steam. If you wish to remove the bubbles on top of the cake, knock the cake tin / moulds few times on the table top to break the bubbles. Personally, I am not bothered by the appearance but the texture. 2. Do not fold in all the flour at one go. Do it by small portion, alternate with flour and juice. Start and end with folding flour. 3. Do cover the steamer cover with a cloth to prevent water vapour from dripping into the cakes. Remove the cover after steaming. If you like this steamed cake, I have other steamed cakes/cupcakes in my collection as well. 1. 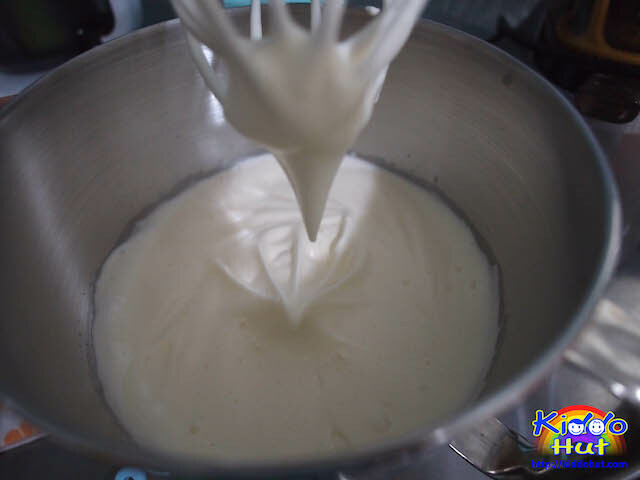 Whisk eggs using electric mixer for 3-5 minutes under low speed till well mix, then add sugar continue to whisk on high speed for another 10-15 minutes or until ribbon stage. 2. (if you are using cream cheese) Whisk the cream cheese into the beaten eggs in low speed for 1-2 minutes. 3. Prepare the steamer. Add some pandan leaves in the water for steaming for some fragrance. This is optional. Line the aluminium tin with some parchment paper or cupcake moulds with liners. 5. Mix honey and milk together. 6. Quickly fold in a small portion of the sifted flour, followed by the olive oil then fold in another small portion of the sifted flour. Followed by a portion of the honey milk mixture, then fold in another portion of the sifted flour. Continue this process until all flour and honey milk mixture are folded in. Start and end with flour. Do not pour all the flour at one go, else it may not be well folded. This process should be done as quickly and gently as possible. After folding in everything, you will see some bubbles forming. 7. (if you are using grated cheese) Stir in the grated cheese. 8. Pour the batter into the tin / moulds. Knock the tin/moulds few times on the table top to burst the bubbles on top. Put into the steamer and steam for 20-25 minutes. Test with toothpick, if the toothpick comes out clean, it is cooked. 9. Open the steamer cover and let it cool. Serve. If you have enjoyed reading this recipe, do like my Facebook page to get more upcoming recipes. You can also follow me on Twitter, Pinterest and Google+ for more updates on recipes. Thank you for visiting Kiddo Hut!